This Small Hard Arkansas Oilstone is the rarest and finest abrasive stone in existence. 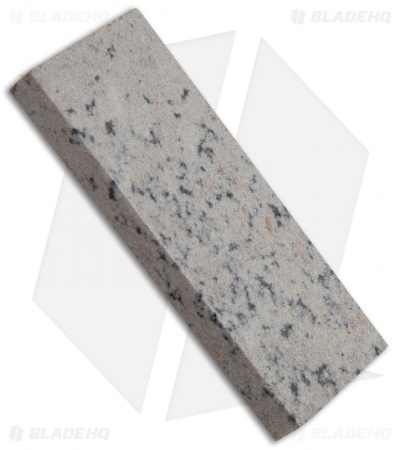 Hard Arkansas is a fine whetstone that is most suitable for fine polishing and the maintenance of a fine edge on knives or tools. This is the stone you'll use every few days to polish a razor sharp edge into all of your blades. It easily fits in pockets, backpacks, or fish tackles. Comes in plastic case. It is a pure form of genuine black Novaculite rock, found only in the area surrounding Hot Springs, Arkansas. With light Honing Oil and smooth even strokes, this rare stone can put a quality surgical edge on any blade. This is the Aston Martin of sharpening stones that will last a lifetime! Variations in color are entirely the work of nature and in no way affect the quality of the stone.